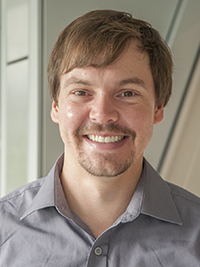 Michael Zwolak is the Biophysics Group Leader in the Microsystems & Nanotechnology Division of the Physical Measurement Laboratory. He received a B.S. in Chemical Engineering from Virginia Polytechnic Institute and State University and a Ph.D. in Physics from the California Institute of Technology. He subsequently was the Feynman Fellow at Los Alamos National Laboratory and then joined the faculty of the Department of Physics, Oregon State University. His past research set the foundations for rapid DNA sequencing with electronic sensors embedded in nanofluidic devices, determined the role of amplification in the quantum-to-classical transition, and provided the theoretical tools necessary to assess heating and fluctuations in nanoscale electronics. He also developed computational algorithms to efficiently simulate many-body, open quantum systems by exploiting matrix product states. Michael’s current research focuses on determining the underlying principles of nanomanufacturing via biomolecular self-assembly, quantifying the behavior of catalytic processes at the nanoscale, predicting properties of nanofluidic devices, and developing innovative computational approaches – both in and out of equilibrium – to guide and interpret next-generation measurement techniques.